Prominently located at the sloping NW corner of Third Avenue and Seneca Street, this 13-story office building was designed to house the offices and equipment rooms of the Pacific Telephone and Telegraph Company. It is now used entirely for commercial office purposes. It measures 111’ x 120’ and exhibits a three-part vertical block façade composition and Italian Renaissance derived architectural details and decoration in the Beaux Arts style. 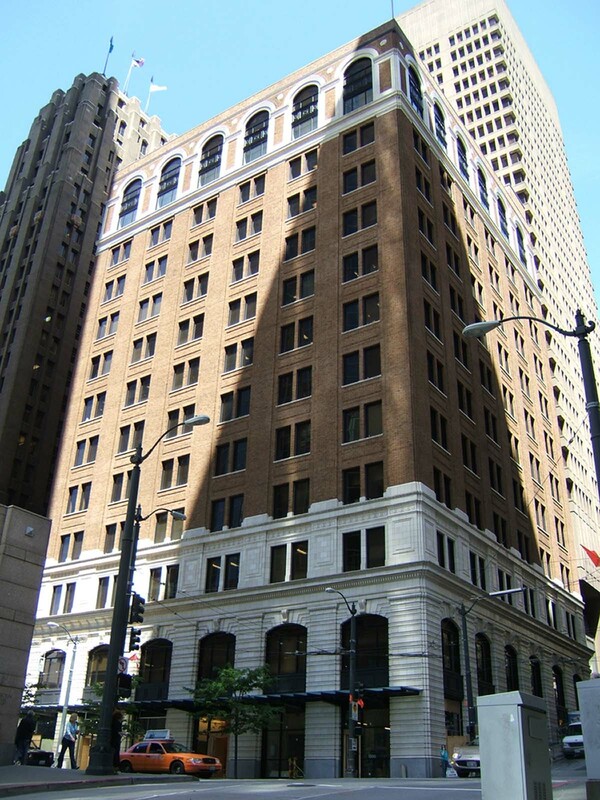 It was constructed in two phases with most portions of the initial ten floors built in 1921 and the remaining full 13-story height completed in 1926. The steel and reinforced concrete structure with foundation and basement is heavily reinforced due to its initial use that included housing heavy equipment. It is clad with cream-color terra cotta (and granite) at the base, variegated red brick laid in a Flemish bond at the shaft and a combination of both at the building cap. The two principal facades are nearly identical in composition, each with a prominent three-story arcaded base, eight story shaft and two-story arcaded cap. Each of the facades is divided vertically into six window bays that correspond over the full height of the building. The base is distinguished by a two-story section clad with rusticated terra cotta panels and accentuated by recessed two-story high segmental arched window openings with decorated terra cotta voussoirs and scrolled keystones. Dark-color recessed second floor level window panels and glazed terra cotta spandrels accentuate this arcade element. Surmounting the window bays is a wide denticulated intermediate cornice above which is a one-story band of paired windows set in terra cotta frames and separated by composite terra cotta pilasters. An ornate intermediate terra cotta frieze and cornice separates this element from the building shaft. The shaft is distinguished by brick-clad piers and recessed spandrels with windows uniformly set in pairs. Terra cotta plinths and caps correspond with each of the piers. An additional intermediary cornice serves to visually cap the shaft. The upper two stories form a distinctive building cap composed of two-story round arched windows with terra cotta arched heads that spring from brick and terra cotta composite pilasters. This arcade is further accentuated by recessed terra cotta spandrels and decorative medallions located between each arch. The roofline is now abruptly terminated by plain parapet as the original heavily denticulated terminal cornice has been removed. Alterations also include the removal of the entire granite bulkhead and all of the original first floor level windows along with the installation of entirely new storefront construction and a modern steel/glass entry canopy. All of the original 3/3 double-hung window sash appear to have been replaced with modern (primarily fixed) sash members. There do not appear to be any intact or architecturally significant interior building features, finishes or public spaces. Booth, T. William and William H. Wilson. Carl F. Gould, A Life in Architecture and The Arts. Seattle: University of Washington Press, 1995. Courtois, Shirley L. METRO Downtown Seattle Transit Project FEIS Inventory Form, 1984. Aldredge, Lydia. Impressions of Imagination: Terra Cotta Seattle, Allied Arts of Seattle, 1986.